December 2018 was a bad month for biotech. According to analysis by Bruce Booth and Pitchbook, 4Q 2018 saw the biggest quarter-on-quarter drop in biotech venture funding in five years. The XBI and NBI saw 10-12% drops over the course of December, falling 20-25% from the summer's peak levels. Moderna's IPO started speculation that IPO investors might have had enough biotech for the time being. But January was a good month. The NBI and XBI have recouped their December losses, Lilly's $8B acquisition of Loxo showed that the M&A thesis is alive and well, and now that the government is open again, investors have their choice of funding a backlog of high-quality IPO hopefuls. Venture funding is recovering as well. 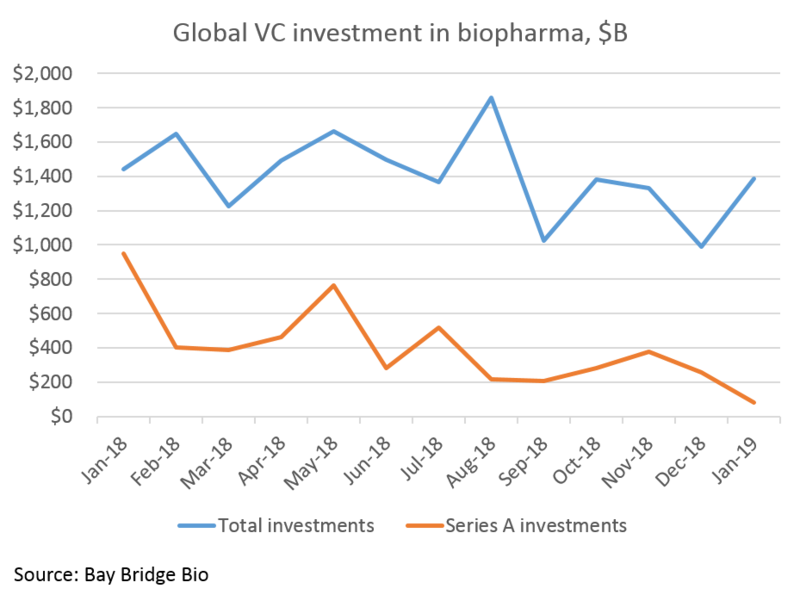 January 2019 saw $1.39B in global venture investment in biopharma – down just a few percentage points from January 2018’s monster $1.44B (and probably about level once you account for Sana, which launched in January with an undisclosed, but reportedly very large, raise). The first quarter of 2018 was a whale of a quarter – with biotech startups raising more money in the first two months of 2018 than in all of 2013 – and Q1 2019 is thus far on pace to match that level, despite the volatility seen at the end of 2018. However, Series A investment seems to be continuing its downward trend. 2018 was a record year for Series A investments with over $5B invested, but Series A funding has dropped steadily since January 2018. January 2018 saw almost $1B in Series A investments alone, while January 2019 saw a paltry $83M. Comparing Series A investments from January 2018 to January 2019 isn't totally fair, however. January 2018 was by far the biggest month for Series A investing of the entire record-setting year, and included BioNTech's $270M "Series A", which, considering BioNTech had raised almost $680 million prior to the $270M raise, doesn't really seem like a Series A. Excluding January, the average month in 2018 saw $380M in Series A investments in biopharma. And January 2019 saw a few notable company launches that did not disclose amount raised, so are excluded from the total. Specifically, Sana Biotechnologies (mentioned above), launched with an undisclosed amount of funding. Sana is backed by Flagship, ARCH Venture Partners and F-Prime, three of the early-stage investing heavyweights, and is reportedly seeking to raise $800M-$1B per an Axios report, which would be one of if not the largest raises on record for a biopharma startup. While the year-over-year drop in Series A levels from January 2018 to January 2019 probably is not cause for concern in itself, the monthly Series A funding data over the last year shows a steadily decreasing trend. Series A investing supports the entire venture and startup ecosystem, and the venture and startup ecosystem increasingly determines which new medicines our world receives. According to a report by HBM, 49% of new drugs approved by FDA in 2018 were owned by small biotechs at the time of approval. And 63% of new FDA-approved drugs in 2018 were developed by small biopharma companies (many of which were licensed to bigger companies before approval). These small companies are largely supported by venture capital. 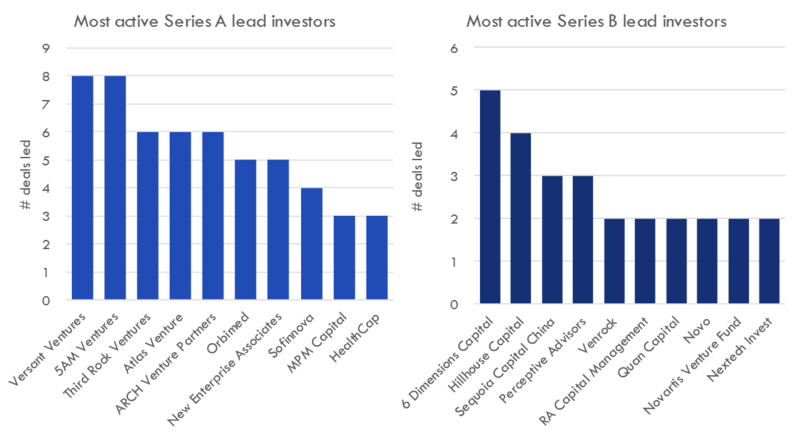 And there are only a handful of funds that support these startups through the riskiest stages with seed, Series A and Series B capital (the figure below reflects 2018 funding data). 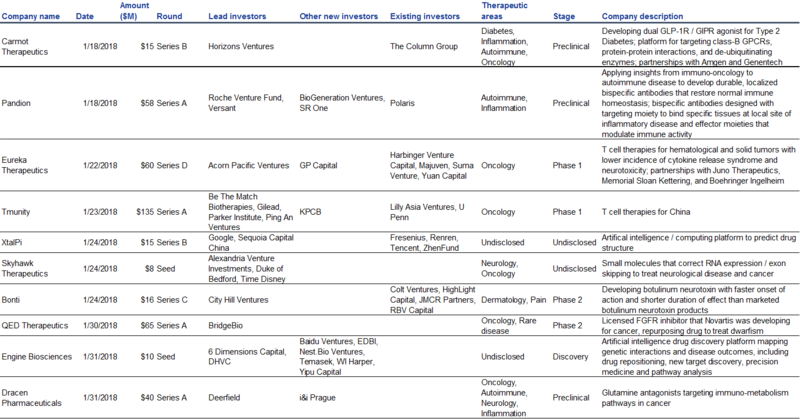 Because so few funds are active Series A investors, and because many of the companies they fund are started in-house, much of the biopharma venture and startup ecosystem relies on these funds. And because the drugs that reach the market are increasingly developed by startups and not big pharma, these few funds have an outsized role in determining what new medicines the world ultimately receives. So Series A funding seems like an important metric to keep an eye on. Will Series A investing pick back up in 2019? There are reasons to think so. Versant, tied with 5AM for the most active lead investor in Series A deals in 2018, closed $700M in new funds in December 2018. Endpoints reported in October that 5AM Ventures is looking to raise a new $350M fund and hired serial entrepreneur Deborah Palestrant to head their 4:59 company creation engine (and 5AM had a very good year on the exit front with IPOs of Homology, Arvinas and Crinetics). Third Rock named three new partners in late 2018, though their last fund was 2016's $616M Fund IV. Atlas raised a $250M opportunity fund in December for later-stage investments. Atlas' latest early-stage fund, 2017's $350M Fund XI, is still fresh, so they probably don't need to re-up for the time being. ARCH released papers in late October outlining plans for a $600M Fund X. ARCH also had a good year in the IPO market, with investments in Homology, Unity, Scholar Rock and Twist Bioscience paying off. ARCH also had a phenomenal M&A outcome with Celgene's acquisition of Juno. Flagship is secretive about most of its investments, so doesn't show up in the above chart, but is nonetheless one of the most active early-stage funds. In December 2017 Flagship raised raised $618M, so probably doesn't need more money at this point (though given the IPO proceeds Flagship harvested in 2018, they probably would have no trouble raising). Of course these funds don't account for the long tail of investors that lead the majority of Series A investments; they're just the heavy-hitters. But if the market stays bullish, it isn't crazy to think that later-stage funds will continue to go earlier and earlier in search of value. So if Series A investment continues to decline, the culprit is more likely to be a shortage of quality companies than a shortage of capital. Which is good news if you're an entrepreneur. Except where otherwise noted, VC funding data was collected from SEC filings, company and fund websites, press releases, news sources and other public sources. Because there’s no centralized source of “truth” for venture funding activity, any list may be incomplete. We’ve listed the financings we’ve tracked below so you can audit the data yourself. We also offer access to our full database of $17B worth of 2018 venture investment in biopharma -- if you are interested in seeing the startups and investors we track, contact us.